Grimsby Wargames Society, the saints of caffeine hands, has a new flag sheet available. This time it's the British North American Regiments flags used from 1775-1783. First of all i like to thank all the people who have used the flags i have created and donated to the Combat Stress Appeal, so a massive thank you. I have also decided to create all the British Regiments of N.America during the years of 1775-1783 which is alot and fingers crossed more people donate to the appeal. All flags are free to download set on a A4 sheet with a 300 dpi printout. 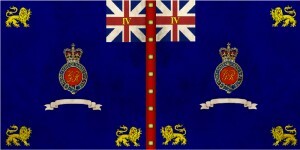 Regiments flags and Kings colours are as follows - 1st foot guards,3rd buffs,3rd guards, 4th reg and the 5th regiment, 10 flags in total.